In Toronto, finding the right neighbourhoods when looking for a place to live can make all the difference. Yet, Toronto condo prices may have you running for the hills or more likely, the Niagara escarpment. However, you don’t have to leave big city life behind in order to find the right place for you or your family. There are actually affordable neighbourhoods where Toronto condo prices won’t cost you an arm and a leg. Black Creek: Commonly referred to as Jane and Finch, this neighbourhood is home to York University (Keele campus) and Black Creek Pioneer Village. West Hill: A diverse neighbourhood filled with parks, West Hill is home to many older residents. Smithfield: Sometimes knowns as the Mount Olive-Silverstone-Jamestown after the major streets in the area, this neighbourhood is home to Etobicoke General Hospital. Kingsview Village/The Westway: Bounded by Highway 401 and the Humber River, this neighbourhood is conveniently located in close proximity to the airport. Humbermede: Also called Emery, this neighbourhood has great views of the Humber River, which is also where it gets its name. Kensington Market/Chinatown: Besides access to everything Chinatown has to offer, this neighbourhood has the famous Kensington Market. It’s important to keep in mind that with any major metropolis, gentrification will eventually take over, causing Toronto condo prices to increase. 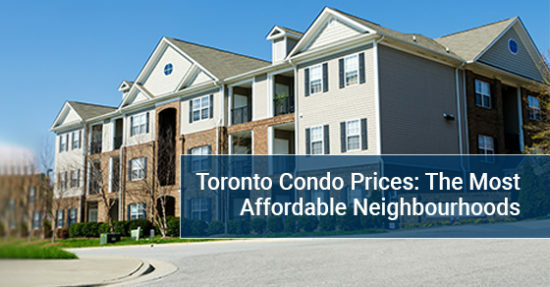 If you can afford to buy a condo in any of the aforementioned affordable neighbourhoods sooner rather than later, you will have an easier time selling it in the future. If you don’t plan on selling your condo and are looking to live in it until you retire, you’ll still want to get in on those neighbourhoods early before they become unaffordable. Besides Toronto condo prices, you should consider other factors before making a purchase. The community: Remember that when you buy a condo, you’re making an investment into the community where the building is. Ask yourself if this is the community where you want to live. If you have a family, does the community have parks and centres where you kids can play? Are there good schools? If you don’t have kids are you looking to live in a quieter community that has older residents? Proximity to work: This is a big one. How long do you want to spend getting to and from work. We all know that the TTC is only reliable 50% of the time, the GO train only services certain areas of the city and Toronto traffic can be brutal. If your commute is going to take most of your mornings and evenings away from you, is it really worth living that far away from your job? Scenery: Does the building have a view you’ll enjoy looking at for years to come? Some people are content with looking out onto a parking lot or facing a brick wall, while other must have a view of Lake Ontario or at least the Don Valley Parkway. If you don’t like what you see when you look out the window, is it worth living in that building? Amenities: Sure you want the building to have amenities, but what about when you leave your condo? Is there a grocery store close by? Do you have to travel far to find a dry cleaner? If your building doesn’t have exercise facilities and you love to workout, where is the closest gym? Fees: You may be saving money on the price of your condo but that doesn’t mean the fees will be cheap. When you buy a condo you’re not only going to have to pay off your mortgage, there are monthly fees as well. People often forget about condo fees, so make sure you include them in your budget. As you can see from the above numbers, it is important to be prepared financially when buying in Toronto, but you will see a major ROI within a few years of purchasing your condo. Plus, condos aren’t nearly as expensive as townhouses or three-storey homes, so you don’t have to worry about paying the average city neighbourhood prices. For more information about where you should buy your condo, or to work with a broker to help you find your dream unit, please contact us. In a city where neighbourhoods are everything, you don’t have to settle for a less than desirable address because of Toronto condo prices.